Honister Slate Mine gets the New Year underway with two major appearances on primetime TV, following visits by a couple of very famous faces. Politician turned broadcaster Michael Portillo visited Honister last Spring, as part of a trip through the Lake District for the new series of BBC2’s Great Railway Journeys. As England’s last working slate mine, Honister is an important heritage site and Co-owner Joe Weir took his special guest underground to see the modern-day mining process. He was also shown an original electric train used by miners in days gone by and followed in the footsteps of Victorian miners on their way to work. The programme, which celebrates the country’s railways, will be transmitted tonight Monday 4 January 2016 at 6.30pm on BBC 2. Also starting tonight is a new weekly ITV series called Griff’s Great Britain, presented by Griff Rhys Jones. One of the eight programmes to come later in the series will focus on the Lake District, with Griff taking on the daunting challenge of ‘skywalking’ across the so-called ‘Infiniti Bridge’ at Honister – thought to be Britain’s longest Burma bridge, suspended more than 2,000 feet above the valley floor. He will also be exploring the terrain in a variety of other ways, such as driving across Wrynose pass in a vintage car and taking to the waters of Derwentwater in a canoe. 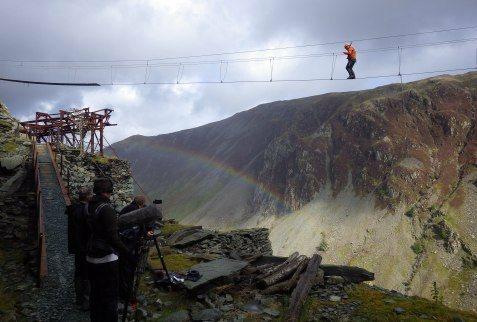 Hi res images attached: ITV crew film Griff Rhys Jones ‘skywalking’ across the Infiniti bridge at Honister.